As part of the forthcoming National Standards for Early Years in the Rep. of Ireland, all practitioners working in the early years sector will be required to hold minimum levels of qualifications from September 2015. For ECCE Room Leaders the minimum will be a Level 6 qualification in childcare, whilst all other staff will be required to hold a minimum Level 5 childcare qualification. 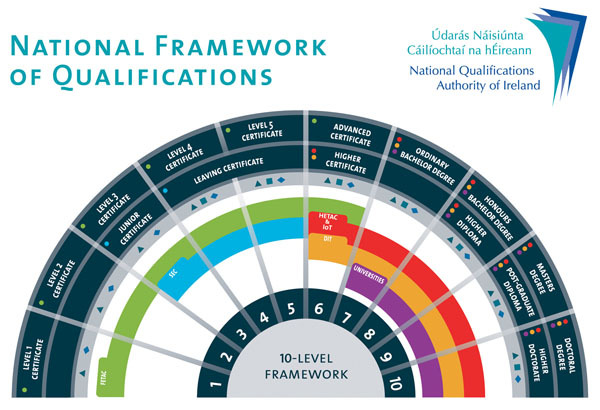 Many people have gained qualifications in the past from bodies that are accredited in the UK and are now wondering where these qualifications stand on the Irish National Qualifications Framework (see graph of this frameowrk below to see how it works). This will confirm that your qualication is, for example, a UK Level 4 qualification. Print off the above two documents, staple them together so you (and the service you are working for) can keep them on file in case your asked for it as part of an audit or inspection.